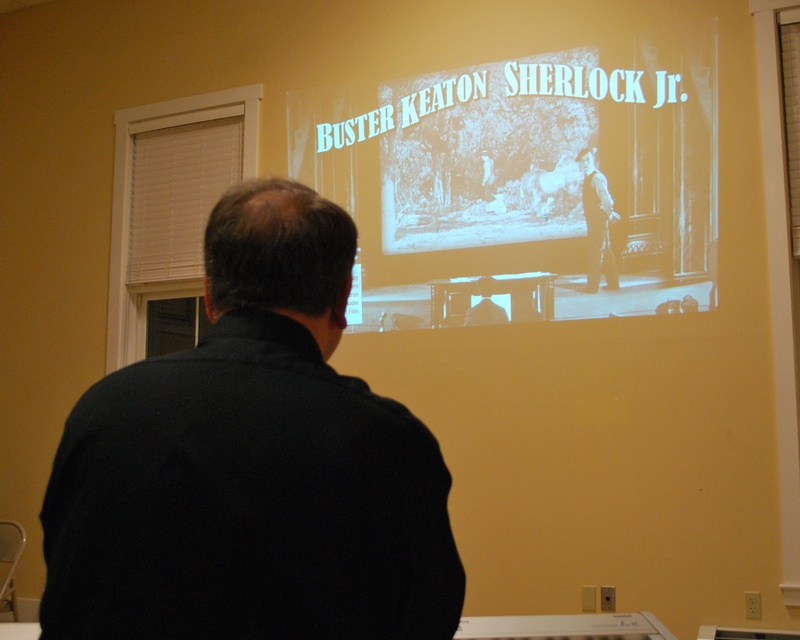 There was a special screening of two classic Buster Keaton comedies at the WCA’s Red Barn on Saturday, November 18. Thanks to Jeff Rapsis, the films were presented as they were meant to be shown – on a large screen with live music. First up was the short film ‘Sherlock Jr. (1924) followed by Keaton’s comic Civil War masterpiece ‘The General’ (1926). He never smiled on camera, earning him the nickname of the Great Stone Face but Buster Keaton’s comedies rocked Hollywood’s silent era with laughter. Acclaimed for their originality and timeless visual humor, Keaton’s films remain popular crowd-pleasers today. A fan of silent films since middle-school, Rapsis brings Charlie Chaplin, Mary Pickford, Buster Keaton and other great actors from the past to life. He does not use sheet music during the performance. Instead, the New Hampshire native carries a notebook of ideas and improvises throughout the film. Rapsis’ approach ensures that each performance is new, fresh and different. Like most WCA events and programs, the screening and concert were free and open to the public. A special thanks goes out to volunteers Darlene Delano, Jessica Ferren, Nancy Large, Susan Nye, Rachel Seamans and Roxanne Shed. Stay up-to-date with WCA activities on our website and Facebook page. This entry was posted in Fall Concert Series, WCA, WCA Events, WCA News, WCA Programs by WCA_Admin. Bookmark the permalink.